Welcome to another Friday! I'm not sure where this week went since it seemed to fly by in the blink of an eye. We Southern Hemipshere-ites officially start autumn today which I’m less than thrilled about because I'm not ready to say goodbye to summer yet. This mornings weather looks decidedly autumn like so thw sun cant be far away for my friends to the North. My favourite thing this week is probably going to polarise the blogging community (Controversy ! Gasp ! Shock ! Horror!) because you tend to either love this or hate it. It came to me on Wednesday night as I was foraging around in the pantry looking for something to eat post dinner. Obviously I wasn’t looking for fruit because I keep that in the fridge...For those of you who are worried about my fruit and vegetable intake I’d already eaten two pieces of fruit and had vegie soup for dinner so I’d kinda had my intake of good food for the day. I deserved to cut myself a little slack. I love licorice. And if it wasn't for the fact that eating a whole bag of it can have some very unpleasant day after side effects I could probably eat a whole bag in one sitting.Thankfully on this occasion I only had about 6 pieces left because I'd used the rest to make this a couple of weeks ago. I know it doesn't look very pretty but it was hot so this licorice ice cream was melting fast. I remember eating licorice flavoured ice cream as a kid and loving it and I haven't seen it in forever. The idea got stuck in my head and so I had a search for recipes and had a crack at making my own. I wonder if I can find a recipe for licorice gelati because that would probably be awesome. My all time favourite licorice is licorice allsorts. I've managed to get Little P hooked on these too... which is probably a fair trade since my Dad introduced me to allsorts when I was a kid. But I must say chocolate covered licorice is pretty darn good too...Oh who am I kidding? I'm a licorice tart. If it's licorice flavoured I'll eat it. So that's my fave thing this week. If you have a favourite thing that you dare to share link it up at the bottom of this post so we can all share your joy! OOPs clicked the wrong thing I've linked up instead of commenting and I won't be ready till tonight apologies. I pretty much can take or leave licorice actually I prefer to leave it only if i need a sugar fix and that is all we have will I eat it. Hubby not so much, but he is fussy he soon tells me if the licorice is not up to scratch. Darrell Lea allsorts use to be his favourite and then they changed the recipe and I haven't been able to find a replacement yet though I have tried. He tends to just eat the whole packet by himself and doesn't worry about the consequences SADLY for the rest of the family I might add. Love licorice...and allsorts.....and choccy covered licorice is amazing.....but it (and all other yumminess like TimTams) have been banned from my pantry....if they are in there I eat them...so best they don't get purchased in the first place. My daughter was home last weekend and was lamenting the lack of snacks in the pantry. A woman after my own heart! Love the stuff - not the red only the black. Ohhh, yuck! Sorry cannot see the appeal at all! 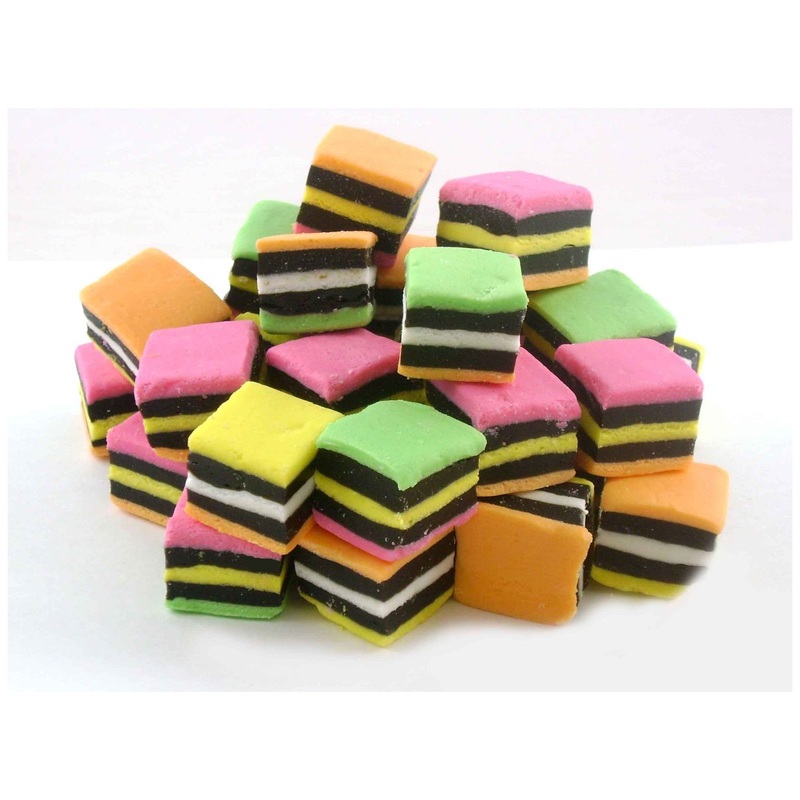 When I was a kid we use to eat the coloured sugar bits out of the allsorts and leave the licorice! Chocolate yes, but not licorice, nope sorry you are welcome to that on your own! Good girl for eating your vegies, bonus points to you! Licorice ice cream?!?! Is this Heaven? That so just made my day. Now I'm going to stare at that pack of licorice and think of how I'm too lazy to drive to the store to get some of my own. We can't be friends anymore. Licorice is gross. Yum. They sell licorice ice cream at my local ice cream shop. Love all sorts, oh and the red one too. Not a fan. Can we still be friends? The red stuff is okay, but not my favorite either. At least if you're eating it, I don't have to! Have a great Friday! Yep definitely a fan especially if it is combined with chocolate. Love all sorts too. Great post about licorice! And only black licorice is really licorice. The red/green/blue/yellow stuff is really only candy twists. I'm glad to know that I'm not the only one on planet earth who can eat the entire bag at one time! Yummmm! Not a big fan of licorice myself but I do like a chocolate bullet or two if there's some going! More for the chocolate than the licorice but any port in a storm! 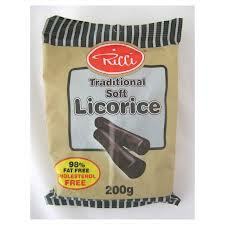 Licorice is something I will generally only eat if I need a lolly hit and there's only licorice left! I love licorice, too, but I have ever seen licorice icecream. Maybe I should have a go at making some? I like the idea of licorice ice cream! Yum!! 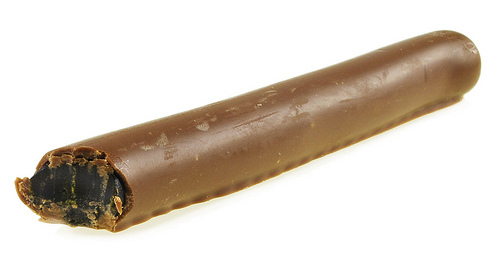 I'm a big fan of chocolate coated licorice. I'm in the "not a fan" portion of the population. My Guy however, loves it. Drama Teen doesn't like it either, so it's the one sweet he can keep around that he knows neither one of us will touch. Mmmm used to love liquorice all sorts...also when I was a 'kid' loved those 'bullets' lollies. A strip of liquorice covered in chocolate. Hee, hee... you need to move to Sweden where they are absolutely obsessed with liquorice. It's the favourite topping for icecream as well and they sell several types of liquorice icecream (black and white striped is my favourite). As a kid I loved aniseed balls, which I bought with my pocket money from the local deli. I adore licorice...so much! I love allsorts, and the 'goodies' (do you have those there?) but most of all, I go to the european import shop for the salted licorice from holland/germany. totally like a breath mint gone wrong, but I love them! [url=http://longchampsoldesk.tripod.com/]longchamp soldes[/url] When sizing Adidas Delta X Tae Kwon Do shoes, men should use their Mulberry Large Oliver Laptop Briefcase Brown for Men and Mulberry Factory shop sale women's handbags featuring totes normal shoe size. Women need to order one number smaller than the men's size. Thus, if you are a woman with a normal shoe size of 6, purchase a pair of Adidas martial arts shoes in a men's size 5..
[url=http://longchamppasche.ucoz.com/blog]longchamp soldes[/url] this debate is so juvenial and i am not even going to spend time on it (read my previous articles that have CO2 calculations per gallon of gas etc. etc). simply because it still snows in winter time is not exactly a lucid argument. When the body is received in a body bag, the seals of the bag are broken and the body is photographed inside the bag. In a forensic autopsy, it is important at this stage for the medical examiner to Mulberry Bags Has many Different Styles And Colors, Shop Favorite Mulberry Zip Printed Leather Purse Light Coffee for Women supply cheap note the clothing of the deceased and the position of the clothing. This is because once the clothing is removed for the examination, any evidence pertaining to the position of the clothing cannot be documented..
[url=http://www.blogstoday.co.uk/bloghome.aspx?username=longchampbagsd]longchamp soldes[/url] There is a huge market of used designer handbags, which are refurbished to new like condition and sold for much lower rates than the Sale Sconto Mulberry Women's Daria Leather Clutch Black Bag popular sale, Fast Delivery and Buy now can save more original price. The already used handbags are collected and restored is such a way that it ties all the loose ends and make it look brand new all over again. The designer handbags do not loose its identity.. But this article particularly focuses on cotton sarees, as they are epitome of elegance. They are unbeatable in looks, elegance and style. Women also give much regard to cotton saris.. A bride looks elegant in minimal jewelry and decent make-up. Heavy jewelry should only be worn with traditional Indian dresses. Similarly, your trousseau should not include only the gaudy bags and shoes, in fact, there should be a mix of different kinds of sandals.. I enjoy licorice too. My favourite - bullets! Really about summer? Nah, autumn is best! I don't hate summer like I used to, but I look forward to a variety of weather types. Bored with warm and sunny every day. Love black licorice, hate the red! What's in the ice cream ingredient list? Anise extract? I love licorice too. I don't know that I've had chocolate covered licorice, but I'll be on the lookout for it now.